Designed to work like a machine all season long, Halex GT is the standard for post-emergence weed control in glyphosate-tolerant corn. 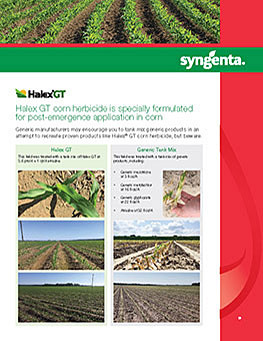 Halex® GT herbicide is for growers who are looking for post-emergence plus residual control in glyphosate tolerant corn. Halex GT controls emerged weeds and, unlike Roundup® herbicide, delivers residual control of grass and broadleaf weeds until crop canopy. 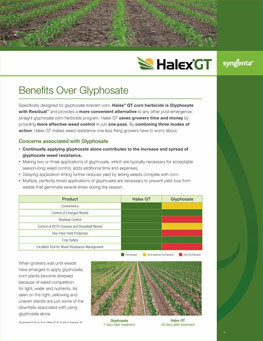 Halex GT is Glyphosate with Residual™ and provides a more convenient alternative to other post-emergence, glyphosate corn herbicide programs. Flexible post-emergence application means no more waiting for weeds to emerge before application. The convenience of glyphosate with the performance of Callisto and Dual Magnum® herbicides. Simply stated, it’s Glyphosate with Residual™. Nine out of ten farmers who try Halex GT would use it again, but don’t take our word for it. 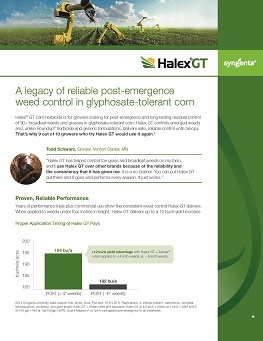 Farmers and retailers across the Midwest have found that Halex GT delivers performance you can count on and protects yield from weed competition when used early post-emergence. We applied a post-emergence application of Halex GT to corn that was six inches tall. After application, there weren’t any weeds in our field. I’m very happy with Halex GT. It does an incredible job each year, so we continue to use it. When we use a Syngenta herbicide, we know they are going to work. We’ve used Halex GT on our corn for about five years. Waterhemp is our toughest weed in this area, and it’s nice to know that we can spray Halex GT and get control of those weeds within a few days. Halex GT really works well. The residual control of Halex GT is great, and we don’t have to worry about our field being full of escaped weeds at the end of the season. When the combine runs through, we have a nice, clean field. 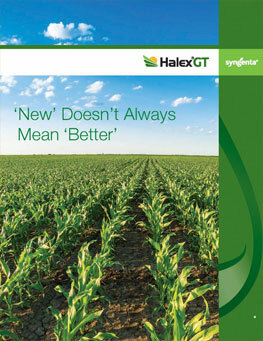 Halex GT is a great product that controls our problem weeds and doesn’t damage the crop. Our toughest weeds are velvetleaf and waterhemp. 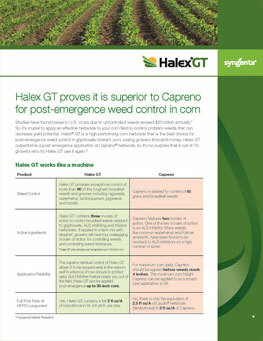 Halex GT controls those weeds very well. 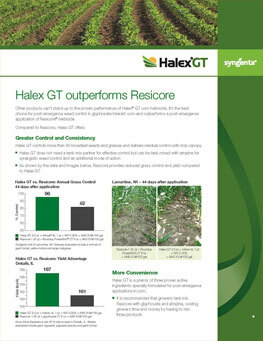 With Halex GT, we have season-long residual control and a clean field at the end of the season. If my neighbor asked me what I thought of Halex GT, I would tell him if you haven’t used it, you’re missing out on a very good product. Halex GT is a good, solid herbicide. You’ll have clean fields until harvest. Our main weed problems are glyphosate-resistant pigweed and marestail. I recommend Halex GT because it has several modes of action to fight against resistance issues, especially against pigweed and marestail. Halex GT has done a very good job with controlling them. We tank mix Halex GT with atrazine, which gives us the control that we want. 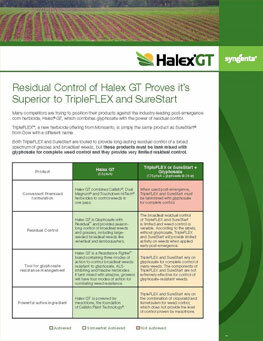 Halex GT stands out as a product for resistance management because of its multiple modes of action, which is what growers should look for when creating a resistance management program against different weeds. I’m very happy with Halex GT. Halex GT has done a great job against our most problematic weeds so that growers can have a timely harvest without having weeds as a major issue. Most growers use this herbicide because of its versatility, and it’s hugely important to have multiple modes of action to help control these tough resistant weeds. Halex GT works. If my customers ask me about Halex GT, I would recommend that they look at it. It’s a quality product. It does the job. Our toughest weeds are giant ragweed and lambsquarter. 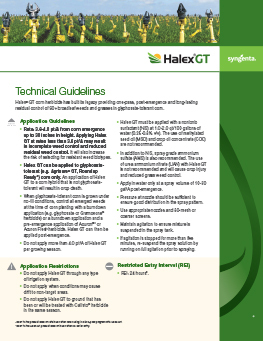 I think that 9 out of 10 growers continue to use Halex GT each year because of the crop safety and wide window of application up to 30-inch corn that this product provides. It has multiple modes of action, which is important to fight against weed resistance. Halex GT controlled the weeds this year extremely well. These corn fields are spotless and the residual control is excellent. I’ve recommended Halex GT since it came to the market. 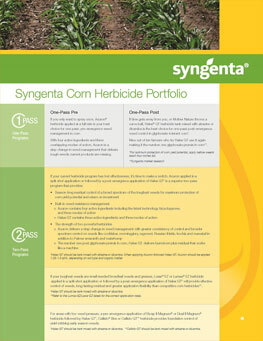 It has great flexibility with being able to apply it post-emergence in corn. 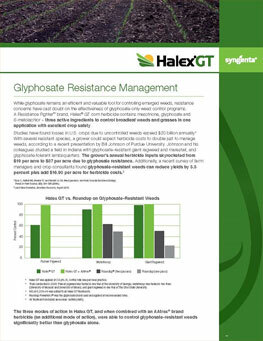 It’s important to use a product like Halex GT that has multiple modes of action for resistance management. The residual of Halex GT was very good. Nine out of ten grower who use Halex GT use it again because this herbicide has great flexibility and a wide range of application timing. ©2019 Syngenta.Important: Always read and follow label instructions. Some products may not be registered for sale or use in all states or counties. Please check with your local extension service to ensure registration status. The trademarks or service marks displayed or otherwise used herein are the property of a Syngenta Group Company. All other trademarks are the property of their respective owners. FFA and the FFA emblem are registered trademarks of the National FFA Organization and used with permission. Use of the FFA name or mark being used does not represent an endorsement by FFA of this product or service or an endorsement by FFA of the manufacturer or provider of this product or service.